In 1925 Walter Eckinger Junior was born as well as Betty Reisling, who would eventually be Walter Junior’s wife and an important part of the success of the company. In 1927 Walter Senior was able to quit his job in the coal mine to work full time in the construction business. During the depression years Walter Senior continued working in the construction business while doing any other miscellaneous jobs that he could do to support his family. After the end of the depression Walter Senior resumed working full time at the construction business building custom homes and doing remodel work. In 1941 Walter Junior started working for his father in the construction business working summers and weekends during his high school days. In 1943 Walter Junior enlisted in the US Marine Corps where he would eventually be rewarded the distinguished Silver Star. 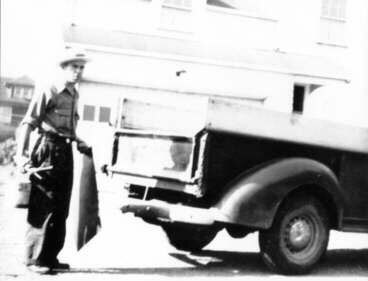 In 1946 Walter Junior return from his military service and joined his father in the construction business. Throughout the late 40s and early 50s the construction company was quite busy as returning GIs needed housing. The company gained a reputation for building quality custom homes in the Canton Ohio area. In 1955 Tom Eckinger was born. Throughout the 1960s as the housing market slowed down the company turned to doing more commercial work for various businesses in the Canton Ohio area. This work included several bank projects as well as doctors offices and medical buildings. In 1960 the DeVille lumberyard in Canton Ohio had a large fire. The company was hired to rebuild the lumberyard buildings throughout. This began A decade of doing various restoration work in the Canton Ohio area. This included the rebuilding of Seibolt Chevrolet in East Canton Ohio when it substantially burnt down. From 1963 through 1967 the company completed several projects for the Hoover Company. These projects including remodeling of their offices, many restoration projects at the Hoover farm, and the conversion of an old farm into a lodge in which Hoover used for guests. In 1964 the company built the Windsor Medical Center which was an early senior citizen health care center. In 1968 the company added an addition to this facility. From 1965 through 1975 the company did all the construction and maintenance at both the Canton Motor Speedway and the Barberton Motor Speedway. In 1970 the company began building stores in shopping malls the first being the Fleicher Shoe Store and the Nobil Shoe Store in The Belden Village Mall in North Canton Ohio. The company built a total of eleven new stores in the Belden Village Mall when it was being built new. Over the next 10 years the company built all of the Nobil Shoe Stores throughout an 18 state region. In 1972 Walter Eckinger Senior passed away. In 1973 both Tom Eckinger and Rick Eckinger joined the company. In 1977 the company began working for the Melville Corporation out of New York City. At the time the Melville Corporation was one of the largest retail store companies in the United States. Among the many stores that Melville Corporation phone was Tom McCan Shoes, KB toys, Chess King, This End Up Furniture and Linens ‘n Things. In 1981 Eckinger Construction Company Incorporated. In 1981 Phil Eckinger was born. The following year Jeremy Eckinger was born. In 1982 the company moved into its current location. In 1984 Janice Holdsworth, daughter of Walt and Betty Eckinger started working for the company. In 1986 Nancy Eckinger wife of Tom Eckinger began working for the company. Both Janice and Nancy continue to work for the company. In 1986, 1988, 1990, and 1994 the company was named Melville contractor of the year. In 1987 the company started building and remodeling drugstores throughout a 12 state region. In 1988 the company acquired it’s first state contractors license in South Carolina. In the upcoming years the company aggressively acquired additional licenses. The company currently is licensed and registered in 46 states and throughout Canada. In 1988 the company purchased its first company owned airplane. Since then the company has operated several airplanes flying nearly 1,000,000 miles. All of these miles work piloted by both Tom and Jeremy Eckinger. Throughout the 1980s and into the 1990s the company built stores across 36 states for numerous national retailers. In 1991 Walter Eckinger Junior and Betty Eckinger both retired. Tom Eckinger was named president, and Rick Eckinger was named vice president upon their dads retirement. This began the third generations of Eckinger’s to run the company. In 1994 Dean McLean a long-time employee retired. Dean began working for the company when he was 18 years old, he then retired after 44 dedicated years of service. In 1997 Walter Eckinger Junior passed away. In 2000 the company was awarded Waldenbooks contractor of the year. In 2004 the company completed its first project in Canada with the renovation of a Dave and Busters entertainment facility. Throughout the 2000s the company built stores and restaurants across 46 states for numerous national clients. In 2013 Phil Eckinger was named president and Jeremy Eckinger was named Vice Pres. beginning the fourth generation of Eckinger’s to run the company. Tom Eckinger remained as chief executive officer.